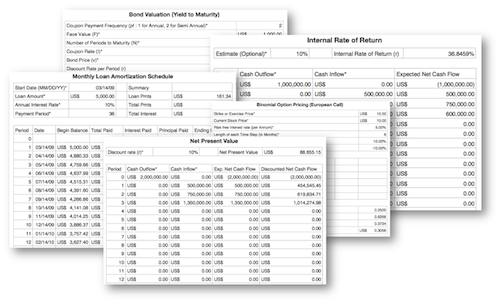 Finance Toolkit is a comprehensive suite of touch-based investment spreadsheets and modeling templates developed by ConnectCode. Equipped with over 50 financial templates in many different categories of finance, it significantly improves the productivity of investors and analysts on financial calculation, modeling and analysis. The Finance Toolkit app serves as an index for ease of access to all spreadsheets. Upon selecting a particular finance subject, the Toolkit app will display the general usage description of the spreadsheet and provide the option to launch the spreadsheet in iWork Numbers. In short, the toolkit evaluates portfolio performance by using Jensen's Alpha, Sharpe's Ratio, Treynor Index and Portfolio Risk techniques; creates complete loan amortization schedules for different payment frequencies; manages investments by valuing bonds, options and equities; calculates various types of yields and returns; determines the Cost of Equity using Dividend Growth Model and Capital Asset Pricing Model (CAPM); evaluates the share price of a company using Free Cash Flow to Equity and Free Cash Flow to Firm; determines the feasibility of an investment through Capital Budgeting; calculates Time Value of Money (TVM) such as Present Value (PV), Future Value (FV), Net Present Value (NPV) and Internal Rate of Return (IRR). Have you thought about how many times you use or reuse your financial models? Everyday, day after day, model after model and project after project. We definitely have. That is why we build all our financial templates in a reusable, customizable and easy to understand manner. We also conduct vigorous tests on our templates with different scenarios, so that you know you can be assured of their accuracy and quality and that you can save significant amount of time by reusing them. We also provide comprehensive documentation on the templates so that you understand how our models work. Our template models are available only in black and white color. We believe this is how a professional financial template should look like and this is the easiest way for you to understand and use the templates. All the input fields are marked with the ‘*’ symbol for you to identify them easily. Whether you are a financial analyst or investment banker, whether you are a student aspiring to join the finance world or an entrepreneur needing to understand finance, we hope you will find this touch-based spreadsheet package useful as we have put in our best effort and invested a lot of time to develop them. Have A Question On Finance Toolkit? Contact us at support@connectcode.net or check out our FAQ page. When a spreadsheet is launched from Finance Toolkit, the iWork Numbers app crashed. Solution 1 : Please upgrade your iWork Numbers to version 1.4. This will resolve the problem. Solution 2 : Alternatively, if you do not want to upgrade your iWork Numbers, simply go to the Numbers app and delete the spreadsheet previously launched from Finance Toolkit. The crash occurs if a spreadsheet was imported to Numbers partially and a new spreadsheet of the same name is launched from Finance Toolkit. Industry Proven - We have distributed financial spreadsheets for many years. All the models and templates are tested vigorously and have received positive feedbacks from the industry. Ease of Use - The spreadsheets are designed for touch devices and are ready for use out-of-the-box. 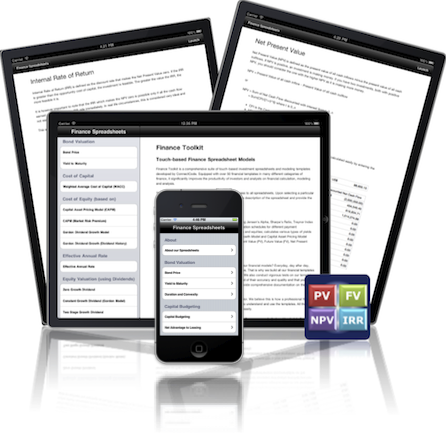 The comprehensive in-app documentation also enables quick understanding and and use of the spreadsheets. Ease of Customization - Our models are designed to ease customization and can be easily reuse in other financial models. You will need to have iWork Numbers installed to use and customize the spreadsheets. We definitely recommend version 1.4 (or onwards) though the spreadsheets work on previous versions as well. Unless otherwise stated, most spreadsheets are designed for Portrait mode.